Pete North Politics Blog: What the hell is Ed Conway playing at? What the hell is Ed Conway playing at? The head of one of the world's leading economic organisations has cast doubt on claims that a "no-deal" Brexit would be an economic catastrophe, pledging that the international community would "roll with it". Angel Gurria, secretary general of the Organisation for Economic Co-operation and Development (OECD), said that even the worst case scenario in Brexit would nonetheless prove manageable. A no-deal Brexit refers to a situation where the UK will leave the EU with no agreements in place for what the future relationship will look like. It means the UK will fall back to World Trade Organisation (WTO) rules on global trade. 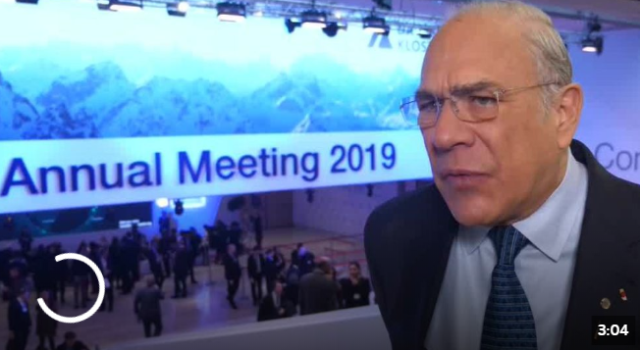 Talking to Sky News at the World Economic Forum meetings at Davos, Mr Gurria said: "A no-deal, WTO rules…the whole world is running by WTO rules these days. This is yet another failure of media where the only piece of information that gives credence to this otherwise worthless opinion is the fact that it comes from the secretary general of the OECD. For sure, Angel Gurria has had an accomplished career, but there is nothing to indicate a comprehensive knowledge of EU trade (which accounts for half of the UK's trade) nor is he especially equipped to comment on the vagaries of Brexit. But then it wouldn't matter were that not the case. With or without further context his assertion is wrong. It is not a credible or useful addition to the debate. Given that Conway has previously demonstrated some knowledge of the complexity of trade it cannot be the case that he does not know this and is not equipped to challenge this assertion. But he does not. He instead makes a feature of it. This has obvious consequences. As much as people sadly believe what they read in newspapers and see on television, they especially believe it if the source carries prestige. And in this instance that particular job title is all the prestige you can get. Here my friend Tim Sennett ably illustrates this phenomenon. Mr Pemberton here is totally taken in by the prestige of title thus accepts the assertion as gospel without further inquiry and is rewarded with 23 likes for parading his ignorance. Conway, therefore, has knowingly taken an editorial decision to reinforce a bogus narrative on a matter of crucial national importance thus has elected to abandon his obligation to inform. It is now well established what the legal position of the EU is on Brexit day should we leave without a deal. This is not something that is subject to opinion. The EU's own Notices to Stakeholders outline the official legal status of the UK and there is a more explicit press release explaining how all of the official controls will come into play in the event of no deal. For a professional hack, it should not be too difficult to triangulate and extrapolate a meaningful understanding of the immediate consequences. Instead Conway has used the words of Angel Gurria as though they were meaningful reassurance that the UK is able to absorb a body blow to its European trade as well as losing access to all of the current bilateral relations the EU has with the rest of the world be they FTAs, MRAs, MoUs or interagency/academic cooperation programmes. This creates further propaganda fodder for the likes of EuroGuido, which then goes viral within a matter of minutes. Even a cursory fiddle with the EU's Treaties Office Database would disabuse any enquiring hack of the validity of Gurria's comments. The only real news here is that the secretary general of the OECD is really that ignorant. One would have thought that would be a more alarming headline. Conway is certainly not alone in this journalistic malpractice. All of the major networks have abandoned any obligation to verify the veracity of sources and instead accept lazy assertions as the basis for news. It may be cheap and easy for Conway, but for the rest of us it will be quite painful indeed. Can Britain cope with no deal? Is Britain too sick to survive?